I slept very lightly last night, afraid that at any moment the sprinklers in the Cambridge park were going to come on and soak me and my sleeping bag. Although I stayed dry all night, as soon as the sun came up I gave up on sleep and packed up my bike. David and I hadn't made any explicit plans on riding together, but we met each other again in the only restaurant in town and decided to both travel at least as far as Halfway. 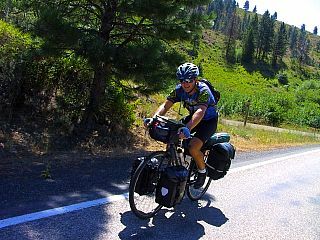 Our morning ride out of Cambridge was a moderate but constant uphill as we rose 1,500 feet over fifteen miles before cresting a pass and dropping down alongside the Snake River in Hell's Canyon. 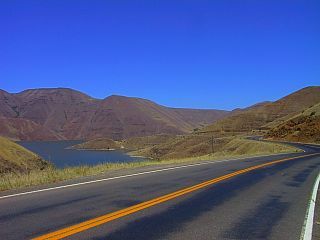 We were fortunate that the temperatures in the canyon were only in the high nineties, as temperatures around 120 aren't uncommon here and some of the eastbounders I had met had come through the canyon during a heat wave. When we crossed the Snake River we also crossed into Oregon, but once again there was no sign and I had to forego my traditional stateline photograph. We had passed between states on a private road owned by Idaho Power in a rural part of the country, and apparently our spot wasn't important enough to warrant a "howdy". The lack of signage was partially made up for, though, by the wild plums and apricots that grew alongside the river and provided us with a midafternoon snack. Spending the day talking off and on with David kept my mind from going onto some of tangents I've been exploring lately, and we talked mostly about the upcoming end of the ride and our plans thereafter. We are similar in that neither of us has anything concrete planned, and both of us plan to spend some time resting in Oregon before jumping into anything new. As the afternoon came to a close we climbed a short distance out of the canyon and stopped in the town of Halfway. Since I had mail to claim here in the morning I knew I wasn't going any further, but David had been considering pushing on at least one more town. But according to two eastbounders we met in Halfway, it was a much more pleasant stay than the next stop and David decided to stay as well.